Which international diplomat was recently awarded an honorary 10th Dan black belt? What is the percentage of women in Singaporean corporate boards? These were some of the questions asked in the finals of the Straits Times-Ministry of Education National Current Affairs Quiz, more popularly known as the Big Quiz, which saw Raffles Institution, Hwa Chong Junior College, River Valley High School and Nanyang Junior College engage in a gruelling contest of speed, knowledge and argumentative ability. The intense competition was reflected by the supporters from the four schools, who had turned out in force. 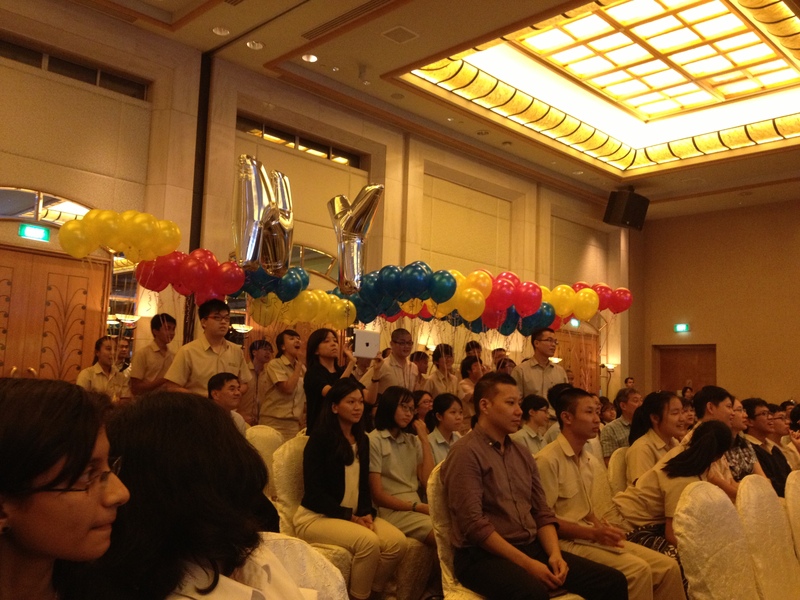 A contingent of Nanyang supporters even arrived with a flotilla of multi-coloured helium balloons, awing everyone in the conference room. While the RI supporters were less well prepared, they nevertheless made two personalised banners in a display of solidarity. At the far end of the Grand Copthorne Waterfront ballroom, quiz participants Gabriel Wong (14S03O), Jeremy Khoo (14A01B), Kuek Jia Yao (14S03R) and reserve member Ng Qi Siang (14A01C) paced about in brooding silence. One member adjusted his tie nervously. The team had good reason to be anxious. They were up against formidable opponents, with the River Valley delegation coming in first in a preliminary round, taking only about 9 minutes out of a given time of half an hour to answer 50 multiple-choice questions. 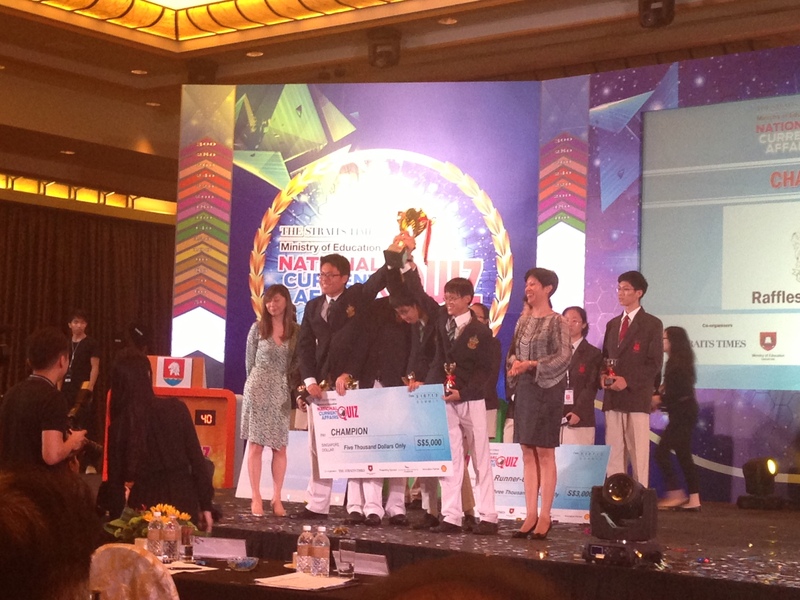 Furthermore, Hwa Chong had emerged victorious in the semi-final round. The competitors were also burdened by the legacy of their predecessors, who had won the inaugural edition of the Big Quiz last year. The team in fact rejected a pre-match interview and chased this writer away in an attempt to collect their thoughts before the quiz. They didn’t have much more time to do so. Music suddenly blared from the speakers as the stage lights swivelled wildly. The audience quietened in growing anticipation as the quiz master and the guest of honour stepped onto the stage and gave a short introduction to the Big Quiz. The teams strode to their positions on the platform, some smiling, some solemn, all met with roaring cheers from their supporters. The Big Quiz was on. The first of the quiz’s four rounds was ‘Think Fast’, which allocated 1 random question to each team for 5 sets. 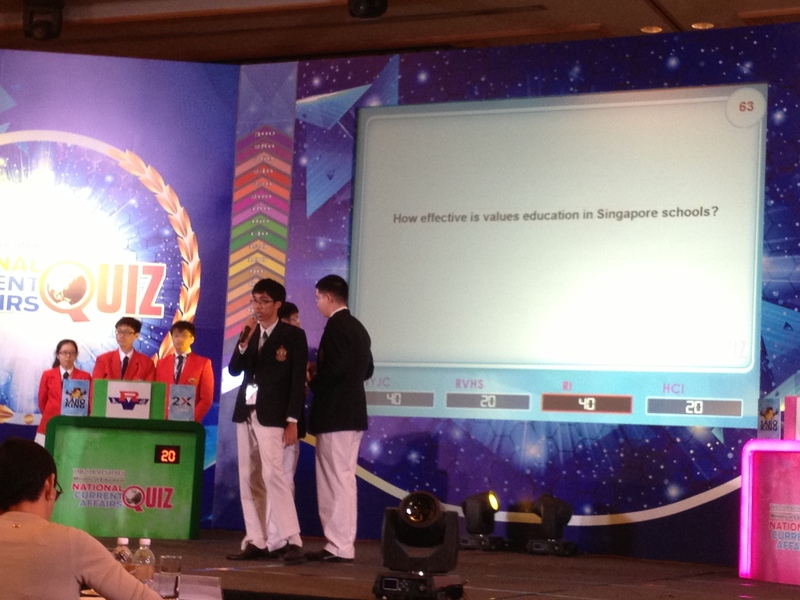 The teams had to answer each question within 10 seconds, and garnered 10 points for each correct answer. NYJC surged ahead in the early stages of the round, being the only school to answer their second set question correctly. However, they allowed RI to catch up in the last set, with our team breezing through its final question ‘Which 16 year-old Pakistani girl recently gave a speech in front of the United Nations?’ (Malala Yousafzai). The score for that round settled at 40 points for NYJC, 20 points for RVHS, 40 points for RI, and 20 points for HCI, giving the RI team some breathing space. The second round, dubbed ‘Make your Point’, required the teams to randomly choose one question, with all three members of the team required to make a presentation of 90 seconds on the topic. NYJC, which got the question ‘Do Singaporeans complain too much about the transport system?’, was evidently flustered by the strict time limit, giving a vague speech that failed to address the main concerns of the question. This was to be characteristic of all four teams to varying degrees, though the RI team’s presentation was relatively more cohesive and articulate, thanks to Gabriel’s 45-second long conclusion. After thorough deliberation, the judges awarded 20 points to NYJC, 10 points to RVHS, 40 points to RI and 30 points to HCI, warning the RI team that it had barely edged on HCI for the top spot in the round. Nevertheless, the scores stood at 60-30-80-50 at the end of the second round, giving RI a welcome 20-point lead. The competition entered its most intense phase in the third round. In ‘Team’s Choice’, the teams gained or lost 10, 20 or 30 points depending on the question category they had chosen, and whether they had answered the question correctly within the allotted 10 seconds. Each team also had two one-use special cards for the round. The X2 points card could only be used before the teams saw the question in the category they had chosen, and doubled the amount of points each team would win – or lose. The Sabo King card allowed the user to force another team of their choice to answer their question, and could be used after the question was unveiled. If the other team answered the question correctly, both teams would gain the relevant amount of points. If it did not, only the sabotaged team would lose points. The high amount of points at stake and the special cards meant that even a single mistake could destroy any chance of victory, heightening the tension. The Sabo King card was quickly used in the first question set of the round, when RVHS shot the 30-point question ‘What is the percentage of children under 3 who use electronic devices?’ (65 percent) to HCI. Hwa Chong answered the question adroitly, bringing the score to a razor-thin 70-60-80-80. RI’s own 30-point sabotage against HCI, which it failed to answer correctly, prompted the Hwa Chong team to adopt a high-risk, high-return gambit, with the team consistently choosing the 30-point category in a desperate bid to overtake RI. Raffles supporters were kept at the edge of their seats, the suspense culminating when NYJC sabotaged our team with the 30-point question ‘Which woman won the Man Booker Prize twice?’, which would make or break RI’s chances at the championship. Yet they need not have worried; the team could barely contain their glee, with Jeremy decisively answering ‘Hilary Mantel’, sending the audience wild. The round closed at 70-90-180-130, essentially making the quiz a two-horse race between archrivals RI and HCI. Victory, though, seemed firmly seated in our hands. Thankfully, the final rapid-fire buzzer round that allowed teams to gain or lose 10 points per question held no surprises for us, with RI maintaining a comfortable lead over its nearest competitor. The tension had largely dissipated after the climax of ‘Team’s Choice’, and the last round was mainly characterised by the struggle between RVHS and HCI for the second place and a lucrative $3000 prize. RI, dominant in the previous rounds, was more muted due to a combination of a cautious strategy and unreliable buzzer-hitting reflexes. The final scores stood at 40-150-210-180, with NYJC regressing back to the same score it had at the end of the first round when it was in the lead. RVHS and HCI had valiantly narrowed the gap with RI, with RVHS in particular scoring an impressive 60 points in the buzzer round. Nevertheless, their efforts fell short, and RI emerged as the defending champion of the Big Quiz. The team hoisted their trophies and their $5000 cheque in triumph at the prize presentation ceremony, smiling amidst the ecstatic applause. Indeed, RI’s victory was much narrower than the fourth round suggested. A considerable bit of luck was naturally present in RI’s victory. The team admitted that they could have been locked in an even fiercer title fight had the special cards been played differently by the other teams. The HCI team’s frustrated expressions at missing the buzzer multiple times also suggested that they could have given RI a greater run for their money. Ryan acknowledged that luck was an inherent part of the competition, commenting, ‘The team came in knowing that they needed luck. No matter how much you prepare, if you get a question that you don’t know with 30 points on the line, and you answer it wrongly, you could be out.’ Nevertheless, it was a fair competition, and a great deal of hard work lay behind the RI team’s victory. Gabriel noted that the RI team had stayed back till 7 p.m. every day for the past month to scrutinise the Straits Times for this quiz. The combination of dutiful diligence and prodigious knowledge was what gave the team a deserved win. 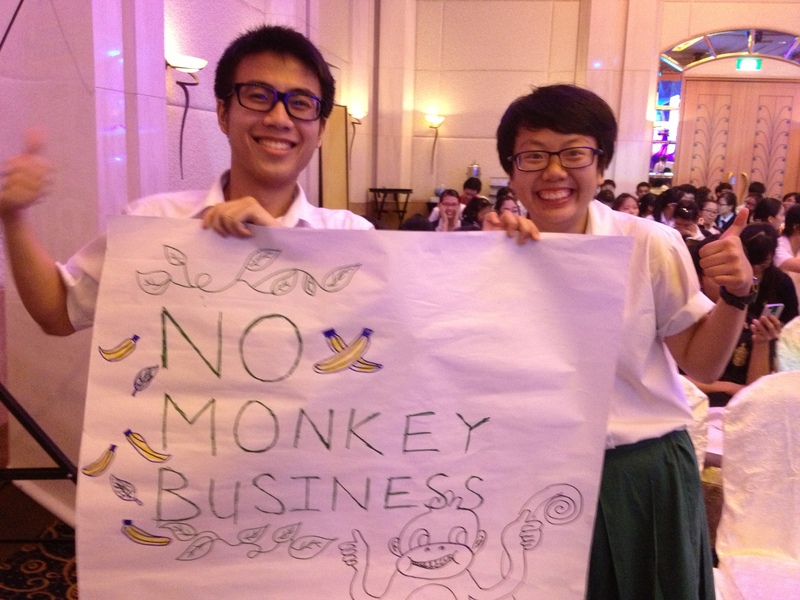 As a final note, this writer would like to commend NYJC for their outstanding display of school spirit and camaraderie. It wasn’t just the overwhelming number of supporters that turned up, or the helium balloons that they bought. The loudest cheers at the closing ceremony came from the NYJC supporters, despite their team coming last in the competition. The touching picture of friendship and unity earned NYJC the ‘Best Supporting School’ award, though the cash might have meant little to them. With RI having won the Big Quiz twice in a row, next year’s team would be under even greater pressure. They could however take solace in Nanyang’s example, and remember that there is more to winning than victory.